Motivation for this article is the analysis of commercially successful and commercially failing online grocery retailers. And the experience as wholesale supplier of two well managed but failing online grocery businesses. Success of online grocery shopping depends on market potential and distribution costs. These key issues are interdependent. If market potential is high, distribution costs are moderately high. If market potential is low, distribution costs are extremely high. Because market potential of online grocery shopping appears to be low, online grocery retailers try to gain market share by lowering consumer prices (and margins). Result is a low margin operation with extremely high operating costs: the ultimate nightmare of every entrepreneur. These three solutions should be combined into a powerful Internet strategy, that should be executed in an excellent way. But there are many pitfalls and critical success factors. The pitfalls and success factors cover the entire marketing mix, the logistics system, information technology and internal organization. In 2000 online grocery shopping was a hype. Some major e-commerce consultants were very optimistic about market potentials. Andersen Consulting used to predict a market share of online grocery shopping of 20 % in the year 2003. These optimistic predictions were used by Peapod.com to explain its high potential, and in 2001 defunct Webvan.com as support of a nationwide investment program of one billion US$. Cap Gemini was even prepared to predict a percentage between 30 and 40 %, but the influential Verdict Research tuned the market potential of online retailing down to 3 % in 2004 for the total retail sector and 2.33 % for the grocery sector. Fact is that in the year 2012 the online food market in the USA and in Europe is less than 0.3 % of total food sales. Potential for the next five years is not more than 0.3 – 0.5 % in the USA and not more than 0.2 – 0.4 % in most countries of Europe. There are four basic reasons why online grocery shopping will never become popular by consumers. Home-shopping of groceries is no fun, it adds complexity to your lifestyle and it is more expensive than buying at the supermarket. On top of those disadvantages: traditional supermarkets are fighting for consumer loyalty by improving their marketing mix and increasing their efficiency. 1. Online grocery shopping is boring. In my view online shopping for dry groceries and perishables is boring. It does not even come close to the fun of buying books at Amazon.com the joy of buying clothes and shoes at Zappos.com, or the excitement of ordering exotic products in China by Alibaba.com. There is absolutely no advantage here over the weekly trip to the supermarket. I dare you to try online grocery shopping a couple of times and see for yourself. Only when an online business focuses on special products and on rich information content, online shoppers will become interested and stay interested. 2. Online grocery shopping is complex. Online shopping is less time consuming than traditional shopping, but it adds complexity to your lifestyle. Let us assume in an optimistic mood that every “household manager” will master the skill of shopping online. After ordering online you first have to be at home and make sure that the goods are properly received. Second you often have to go to the store anyway for miscellaneous articles. Third you have to check proper billing and payment. Fourth you have to follow up on order-picking mistakes and delivery errors. 3. Online grocery shopping is expensive. The distribution costs of home-shopping are twice as high as the costs of traditional food retailing, and most consumers are not willing to pay the extra 15 %. Internet startups will first try to gain market share with low prices and low service fees, but when the shareholders cash is consumed they will have to ask higher than “normal” prices to cover the costs and survive. Of course there is a small niche market for expensive home-shopping services: affluent PC-minded and service oriented consumers and consumers with no easy access to a nearby store. 4. Online grocery shopping is not competitive. In recent years Efficient Consumer Response and Category Management had a significant and positive impact on quality and efficiency of traditional supermarkets. Food retailing has always been a very competitive business, and in recent years super-marketing has become a professional science that is constantly improving the value to the consumer. In the USA, Europe and now also in India, China and South America very competitive stores with Every Day Low Prices and high service levels are gaining market share and are making the food business a war zone for new entrants. Conclusion: the average consumer – with access to a good supermarket – does not have a good reason to go grocery shopping online. 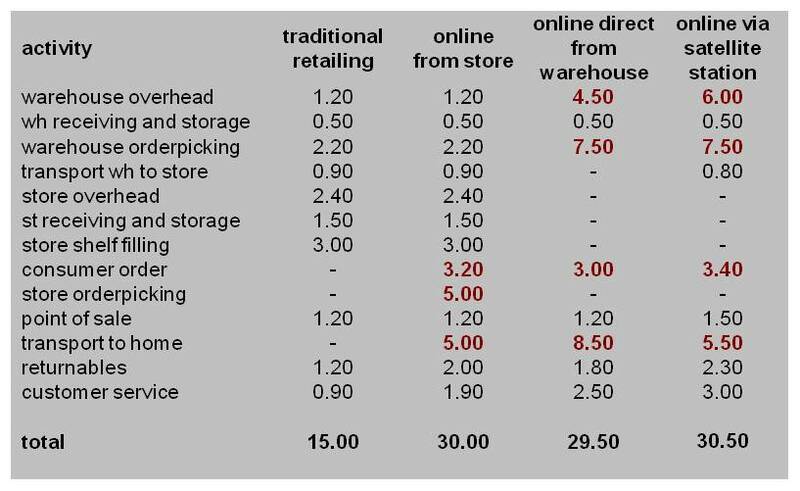 Distribution costs of online grocery retailing are twice the distribution costs of traditional supermarkets. Traditional channels are extremely efficient, because consumers perform most of labor intensive work for the retailer: order-picking in the store and transportation of goods to the home. Costs of these activities are approximately 10 % of consumer price. Online retailers have to pay well trained and professional employees to do this work without errors. An additional 5 % of costs are spend on information technology, order management and after sales service. The additional costs are even higher in case of low market penetration or sub standard execution. Each scenario has its own specific benefits and value chain characteristics. Distribution from an existing store is appropriate for a small online business. Direct home delivery from a dedicated warehouse is appropriate for an online business with a high market share in a medium size densely populated area. Home delivery from a central warehouse via satellite stations is appropriate when the area is larger and the market share is lower. The next table is an overview of supply chain activities and cost structure of each scenario, including traditional retailing. The figures are costs per activity as a percentage of consumer value. [This cost structure is an indication only. In every country and each situation the costs per activity will be different. Outsourcing the delivery process to logistics service providers may add efficiency but will also increase complexity costs]. Peapod.com is the oldest and best known online food retailer in the USA. Peapod once delivered from local stores, but in 1999 the company switched to direct delivery from central warehouses. In this case the delivery fee changed from US$ 16. (very high) to a minimum of $ 6.95 and a maximum of $ 9,95. Nowadays Peapod.com is a full subsidiary of Dutch Ahold, and turnover and profit figures are no longer published. US$ 14.453. Gross margin was extremely low: 5.9 % of turnover. Distribution costs were exactly 30 % of turnover, in line with the cost/profit analysis table. Other costs were: marketing and sales (13.2 %), information technology (5.9 %) and other overhead (19.7 %). The result was a loss of 37.6 % of turnover. Note that this is not a recent startup, but that this company has been in business since 1989. The “about us” section of the website of Peapod.com made in 2000 a remarkable referral to “industry experts” who predicted a 20 % share of online groceries in the year 2003. This example shows two things very clearly. It proves the fact that distribution costs of online grocery retailing are very high. But it also shows that in order to gain market share over traditional supermarkets the company had to invest heavily in price reduction and sales promotion. On top of that: overhead costs of Peapod.com exceeded the total distribution- and store costs of any well managed traditional supermarket chain. Webvan.com was in 1999 a new player in the American market. The company planned to develop 26 automated warehouses in populated areas all over the USA. These warehouses would deliver groceries to consumers via satellite stations. The Webvan case is interesting because it was a combination of high investments in buildings and equipment, and high customer service like a 30 minute delivery window. The very professional “help section” of the Webvan website explained the pricing policy (“prices up to 5 % less than in local grocery stores”), and the product policy of a large and high quality assortment of groceries, perishables and drugstore items. Webvan offered free delivery for orders US$ 50 and over and a delivery fee of US$ 4.95 for orders under US% 50. The handling costs were “50 % less than the grocery industry average”. The problem was that Webvan.com had based its business plan on the same optimistic online grocery market estimations as Peapod. The company filed bankruptcy in 2001. Webvan.com was caught in the same trap of every dedicated online grocery retailer: reducing the extremely high order fulfillment costs means high turnover; high turnover means low prices and high service. And when turnover stays low, the combination of low prices and high service means a very negative bottom line. “Niche marketing” is focusing the marketing mix on a special target group. This strategy is particularly effective for traditional retailers with a high market share and an affluent customer base. These retailers can develop an online channel as service offering, as market development strategy and as barrier against new entrants. In the USA this would be the recommended approach for successful local chains, in the UK for Tesco and in The Netherlands for Albert Heijn. Niche online retailers use their quality image to reach for example 10 to 15 % of their own customers and 5 to 10 % of the rest of the market. Customers will spend on average 20 % of their grocery shopping online. In this way a company like Albert Heijn has the potential to reach about 10 % of total customers and win 2 % of total market share online. The niche target group will consist mainly of affluent service oriented double income families, who are willing to pay the extra service fee. The other niche group are consumers who do not have easy access to a supermarket of choice. Every target group must have affinity to shopping on the Internet. A focus on margin rich products is the most debated solution for online food retailers. Many e-commerce analysts assume, that consumers will prefer to order their heavy bulk products online, and visit the store for the rest of their grocery needs. This assumption about consumer behavior is not supported by practical findings. In practice consumers will try to order enough products to avoid the delivery fee, in most cases set at an order amount of above 100 US$ or the equivalent in Europe. For online grocery retailers the sale of mainly bulk products is the quickest road to bankruptcy, since these products are the loss leaders of the grocery business. There are already many examples of a clear product focus in online grocery retailing. The best example is wine, because successful wine selling requires professional information about the product and its use. Another important online food group is vitamins and supplements. In the USA there were some very attractive examples: vitaminworld.com, nutrimart.com and swansonvitamins.com. I personally order my favorite brand of vitamins at essentialorganics.nl. Online food retailers are also differentiating their business to financial services like banking, insurance and mortgages. Other service areas are video/DVD rental and dry cleaning, but the most attractive product development is non-food. This category is related to food and is therefore an expected extension to the online food business. Walmart USA concentrates its Internet venture on its large non-food assortment, and use online food retailing as traffic builder. The Belgian food retailer Colruyt used online non-food retailing not only as an important margin rich extension of the food assortment, but also as a traffic builder for the supermarkets. Consumers could order the non-food articles online, but had to collect the merchandise at the store. “Information distribution and communication” is the name of the Internet game. 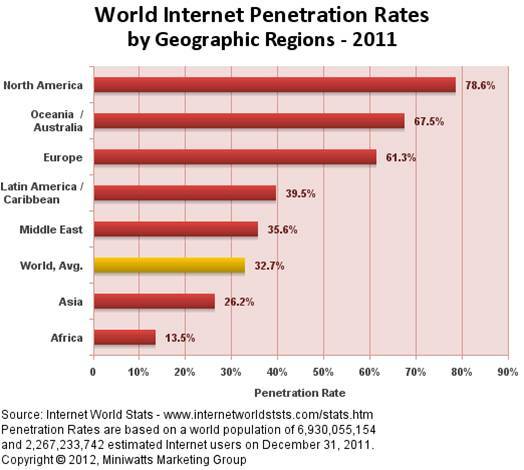 Internet is the perfect channel for targeting different consumers and other stakeholders of the company. In traditional advertising every commercial message is targeting a specific consumer profile with a specific message. Alternatively an Internet site has a menu structure, which makes it possible to communicate a whole range of messages to a wide range of interested target groups. The other major advantage of Internet is the ability to really communicate in two directions. This important feature of Internet already has a great impact on the internal and external organization of any company. David Siegel, the author of “Creating Killer Web Sites” explained the impact of web communication on the organization in “Futurize your Interprise”. Communication with different customers may focus on special products, like low fat or sugar free assortment. Allergy information gives the opportunity to add rich content to specific consumers. Other products that benefit from information are wines, private label products, vitamins and food supplements. Retail organizations also use their website to inform their customers about their internal processes. Randalls.com (Safeway) is an excellent example of a description of the distribution process, and it enhances the professional image of the company. In the USA the Internet is frequently used to distribute coupons. A good example is Pathmark.com. However the disadvantage of Internet distribution of coupons is fraud: the possibility to change rebate figures by the PC. The most promising communication feature is the possibility for customers to respond to the retailers information and marketing mix elements. A retailer may solicit assortment suggestions and complaints. Internet makes it possible to use customer complaints as powerful drivers for quality improvement in the company. Communication with other stakeholders of the company requires much attention but opens many opportunities. Most professional websites already have a special section for shareholders (annual and quarterly reports), potential employees (vacancies and working climate), suppliers (category management approach) and the media (latest news). Each target group gets maximum attention without annoying the others. In case of communication with other stakeholders each target group must have a professional contact in the company, who is responsible for content and direct response. If this is organized in a professional way, the Internet communication will strengthen external relationships and internal responsiveness to the market. Physical distribution of goods ordered online has been called the “Achilles heel” of e-commerce. It is the week spot of a powerful development. In the USA physical distribution is now referred to as “the longest mile”. It is an old trade, that was mastered by an ex Wallstreet investor like Jeff Bezos of Amazon.com. Jeff Bezos solved the sore knees of employees (and himself! ), who were packaging books sitting on the floor, by issuing knee protectors. His partner suggested the idea of purchasing some packing tables, so he told with laughter on TV. When the home shopping market increases, professional service providers will develop distribution networks for general use by different online retailers. This will reduce the transportation costs by approximately 30 % and the total additional online grocery shopping costs by approximately 1.5 % points. Amazon.com is using this concept by sending books by mail, but a 1.5 % point reduction of food distribution costs is too small a gain to change the less then positive outlook of online grocery shopping for the best. Costs of order management and distribution alternatives can be evaluated from a distance using “cost/profit modeling”. It is even better to use this tool in the business plan preparation situation. Cost/profit modeling was used to develop the value chain presented in the table at the beginning of this article. The optimization process of distribution elements will be covered in a different article. The point is that every distribution decision has an impact on all eight elements. It is interesting to show the most important effects of some home delivery alternatives on these distribution cost elements. The decision of Peopod to change delivery from stores to delivery from central warehouses improved handling efficiency but also increases capital investment and the average distance to the customer. The semi automated warehouses of Webvan.com required huge capital investments, but were intended to increase handling efficiency. The use of local satellite stations increased capital investments but also had a positive effect on vehicle fill-rate and vehicle utilization. The very narrow 30 minutes delivery time window of Webvan.com greatly increased average distance between customers. This service element was impossible to maintain, because it tripled the already extremely high transportation costs. Any successful online retailer has to work hard and intelligently on a large number of critical success factors. These factors are critical because failure to excel in one of them may damage the company considerably. We already covered the critical success factors customer targeting, focus on margin rich products and focus on “information distribution” and communication. Economies of scale. High investments in information technology and marketing must at least in the long term be covered by high turnover. Even more important is the necessity of a high market penetration and a dense customer network, in order to optimize delivery costs. Earlier publications on which this article was based have already evoked much discussion. The author invites readers to supply feedback, constructive criticism and new scenario’s to make online food (and non-food) retailing profitable.